UFO SIGHTINGS DAILY: Bob White Alien Artifact That Fell Off Of A UFO, Video, UFO Sighting News. Bob White Alien Artifact That Fell Off Of A UFO, Video, UFO Sighting News. This artifact fallen from a UFO is one of the many pieces of mounting evidence in Colorado that the area near the mountains has an underground alien base. Many glowing objects have been recorded over those mountains. Even police and mayors have recorded them, news agencies publish videos of them, but still the secret where the UFOs come from remains a secret. Its obvious, its an underground base. The ground opens up and closes without even a trace of them traveling through it. REEDS SPRING, Mo. — Bob White is convinced his story deserves a grand stage, that his most prized possession should be displayed before a national audience. 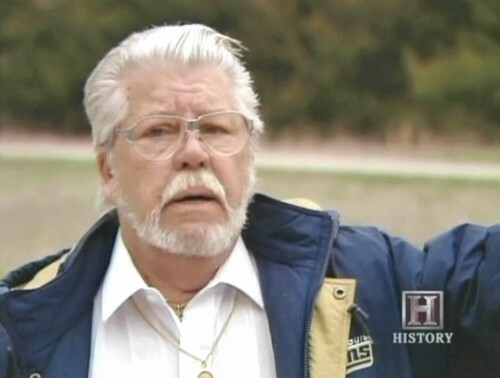 It should draw tourists from all over the country, he figures, and be a major attraction for people who want to see an artifact that White swears was retrieved from a UFO in 1985. Instead, White's find is in tiny Reeds Spring in southwestern Missouri, secured in a locked display case at Museum of the Unexplained, a converted video-rental store that, during a recent morning, went more than three hours without a customer. White can't figure it out. All he wants to do is find some believers. He wants people to quit snickering and looking at him as if he's crazy. He wants them to listen to his story, to take a hard look at his metallic artifact, to give him a chance. "This," White said, "is the most difficult thing I've ever done in my life." The odds are stacked against him. He and his partner at the museum, Robert Gibbons, have been rejected and ridiculed. White estimates he has spent more than $60,000 traveling to conferences, starting the museum, having the artifact tested and retested. And yet he forges on. "I'm 73 years old," White said. "I don't have much longer. "What I'd like to see before I'm gone is the national media get their heads out of their ... "
White paused, choosing his words carefully, "out of the sand. I'd like to see the national media and everybody else realize that what I have is real." 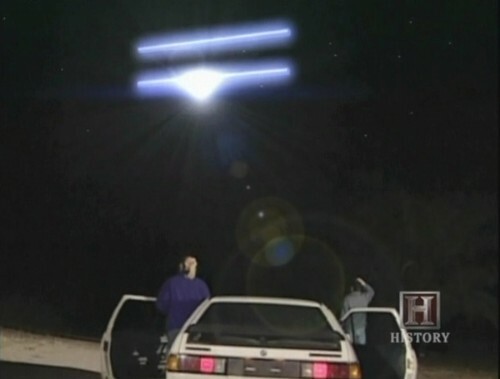 Scientists theorize that the "UFO" lights that White said he encountered could have been nothing more than a meteorite, that his artifact could be space debris. Some scientists who have tested the object said there was nothing extraterrestrial about it. Ask White whether he believed in unidentified flying objects prior to 1985, and he scrunches up his nose. "Never," he said. "Not a bit. I was the biggest skeptic in the world." That all changed overnight. Here's how he remembers it: White and a friend were driving from Denver to Las Vegas on a desolate highway near the Colorado-Utah border. It was 2 or 3 a.m., he said, and White was sleeping in the passenger seat. At one point, his friend woke him up and pointed out a strange light in the distance. White didn't think much of it and went back to sleep. Then his friend woke him up again. This time, White said, the lights were blinding. He got out of the car and stared, dumbfounded. The object was about 100 yards in front of him, he said, "and it was huge ... absolutely huge." In time, he said, the lights bolted toward the sky and connected with a pair of neon, tubular lights — "the mother ship," White guesses now. And just like that, he said, the entire contraption zipped eastward through the Colorado sky and disappeared. "What I saw," White said, "was not of this Earth." As the craft flew away, White said, he noticed an orange light falling to the ground. A locator probe? Something that simply broke off? It was red hot when he reached it, he said, but in time it cooled enough to pick up. White shoved the object into the trunk of the car. The object is about 7-1/2 inches long and shaped like a teardrop. It has a coarse, metallic exterior and weighs less than 2 pounds. 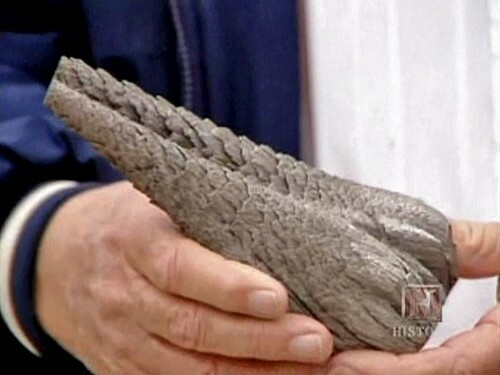 It looks a bit like it could be a petrified pine cone and is composed primarily of aluminum. White has had the item tested several times, hoping for some answers. The Nevada-based National Institute for Discovery Science in 1996 sent a sample of the object to the New Mexico Institute of Mining and Technology. "The metallurgical analysis was pretty mundane," said Colm Kelleher, a scientist at the National Institute for Discovery Science. "We didn't find any evidence that it was extraterrestrial. Now you can make the argument that we didn't spend $1 million and look at every conceivable option. We didn't cover every base." Another scientist who tested it at a California laboratory — and who asked that his name and that of the laboratory not be used — said, "It didn't show any extraterrestrial signature." Sgt. Gary Carpenter, who works at the North American Aerospace Defense Command in Colorado Springs, Colo., said it was not uncommon for NORAD to get calls about strange lights and unidentified objects. Not once, he said, has the object been identified as an alien spacecraft. "Usually it turns out to be space debris from a satellite that's decaying, or it's in the realm of naturally occurring, celestial lights," he said. "It could be something like a falling star. It could be contrails, the things you would see trailing an aircraft." White opened the Museum of the Unexplained with visions of turning it into a destination. He wasn't looking to get rich — according to the Missouri secretary of state's office, the museum was registered as a nonprofit organization in August 2000 — but he hoped to spread the word about his experience. The museum, about 13 miles north of the glitzy Branson strip, might as well be in another world. There are no neon signs pointing the way, no twinkling lights outside the front door. Rather, it's sandwiched between the Humane Society thrift shop and the Sunrise Cafe on Main Street. It has struggled, unable to tap into the Branson spinoff crowd and secure a niche audience of its own. Only 2,800 people went through the doors that first year, when admission was free, and the museum hasn't been able to replicate those numbers since. These days, patrons age 12 and older pay $5 to stroll through about 2,000 square feet of space. Exhibits include a keyboard from the movie "Men in Black II" in which the shift key doesn't capitalize or decapitalize but translates from English to an alien language. Other exhibits are little more than newspaper articles or passages from the Internet affixed to the wall with thumb tacks. The focal point is White's artifact, and he takes no chances with its safety. Motion detectors, closed-circuit TV and window and door alarms protect it at all times. White packs it up in a gun case every day at 5 p.m., and the object never spends the night at the same place two nights in a row. You can never be too sure, he figures, even in a town with just 465 residents. "I'm happy for them that they're having a good time, but I guess I'm just not into that kind of thing," said Kacee Cashman, the Reeds Spring city clerk since 1998. "I really think they've been accepted, but everybody's kind of taking it with a grain of salt." Said White, "I don't know what I have to do to prove this is the truth. You can't make this stuff up."